Volunteers Brian Angelo, Kathryn Taylor, Paul Huttenhower and Michelle Workman preparefood for Aspen T.R.E.E. 's 6th annual Farm-to-Table Free Community Meal, which takes place tonight at the Aspen High School Commons. It’s a localvore’s dream feast. Aspen T.R.E.E. is putting on its 6th annual Farm-to-Table Free Community Meal at 5 p.m. today at the Aspen High School Commons. The community meal will feature the works of five Aspen chefs from foods and ingredients no further away than Paonia and Hotchkiss. 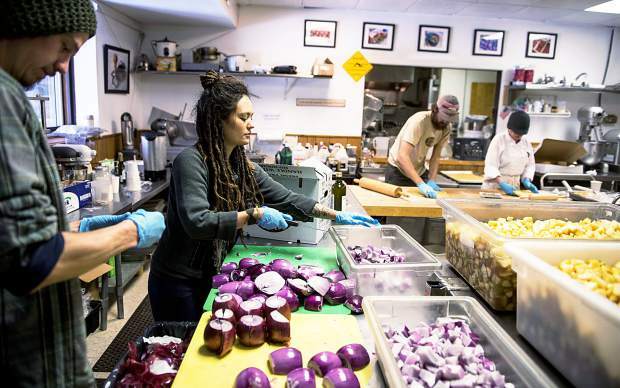 “We are borderline fanatic about all the food being locally grown, and our only non-local items are salt, pepper and oil,” said Eden Vardy, Aspen T.R.E.E.’s director. After thinking for a second, he added mustard to the list of exceptions. Getting all-local ingredients always presents a challenge. Paul Huttenhower, the nonprofit’s program director, made the butter needed for the meal. If you are the type of eater that needs a traditional Thanksgiving dinner, Aspen T.R.E.E.’s meal might not be for you, Vardy said. The main course will be very non-traditional, he said, refusing to offer any clues because he wants it to be a surprise. But if rubbing elbows with neighbors, learning about locally grown foods and how they can be prepared sounds appealing, then the community feast is right up your alley, Vardy said. Vardy started the feast as a way to give back to the town where he was raised and where he returned after college. The first year, the event doubled as a coming-out party for Aspen T.R.E.E., a nonprofit dedicated to agricultural sustainability and education about sound farming and livestock-raising practices. Vardy said he and some friends “gathered our pocket change” to present the meal in 2007. About 150 people showed up for the event. Word traveled about the cool vibe at the communal breaking of the bread. The crew prepared food for an anticipated 400 people the following year and 700 showed up. The numbers of eaters have swelled to more than 1,000 the last couple of years. Vardy said another of Aspen T.R.E.E.’s goals is to promote community. “What better way than to offer free food?” he asked. The event helps Aspen T.R.E.E. achieve its mission of educating people about growing their own food because they learn that farm-to-table events don’t have to be “elitist” in price, and they don’t have to resemble a soup kitchen, Vardy said. The feast provides great food and it’s free. The meal will include roasted potatoes by Tico Starr, of Rustique. Sarah Helsley, of The Cheese Shop, is making veggie gratin. Jim Butchart, director of Aspen Skiing Co.’s on-mountain restaurants, made the autumn-harvest apple soup that will be served when the throngs first arrive. Sean Evans, of Pine Creek Cookhouse, created an apple and pumpkin pastry that features a glaze that seems out of this world, but is truly the result of local ingredients such as rose hips and chokecherries. 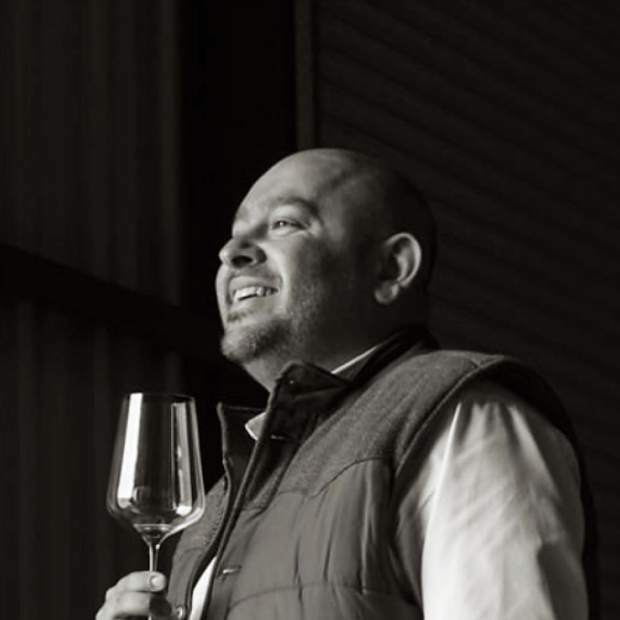 Francis Stuckins is the chef in charge of the mystery main course. “I think people will be even more thrilled” than if it was turkey, Vardy said. To pull off the presentation, Aspen T.R.E.E. enlists an army of volunteers for prep work and serving. About 200 volunteers will assist this year, more than the number of people served the first year. The community meal will be first come, first served. Eaters will be given a ticket with a sticker when they enter. People will be called to eat depending on their sticker type. It will reduce the line from 700 to 25 or 50 at any given time, Vardy said. Plus, people will have an estimate of how long before their group is called, so they can go visit, check out silent-auction items or hang with their kids, he said. This year’s community meal is sponsored by the Ditto Dreman Memorial Fund. Vardy said Ditto Dreman grew up with him in Aspen and recently passed away. His family has started the fund to assist people experiencing hardships and help causes that promote community.